Something a little different for today…I want to introduce you all to a blogger that I enjoy reading for so many reasons – Olena of iFOODreal – Delicious Clean Eating recipes blog. If you are unfamiliar with Olena’s blog then you are in for a treat. Her blog is FILLED with delicious recipes that are healthy, clean and family friendly (and if you can’t already tell – gorgeous). I relate to Olena in many ways…we are both moms striving to be healthier versions of ourselves (with nutrition and exercise) and are focused on feeding our families the best we can. She is very down to earth and real, which I love and admire. You can read more about Olena, her interesting background (she’s Ukrainian and lives in Vancouver), food philosophy and passion for healthy living here. Hey guys. My name is Olena and I am an author of iFOODreal – Delicious Clean Eating recipes blog. Besides eating real and “clean” food, our family believes in eating local, organic and sustainable food as much as possible. Also recently we cut back consumption of animal products significantly, started to focus more on plants and meat became more of a side (as much as it makes sense). Healthier for us and for the planet. Today’s recipe is a great representation of that – hearty, saucy and full of flavour. 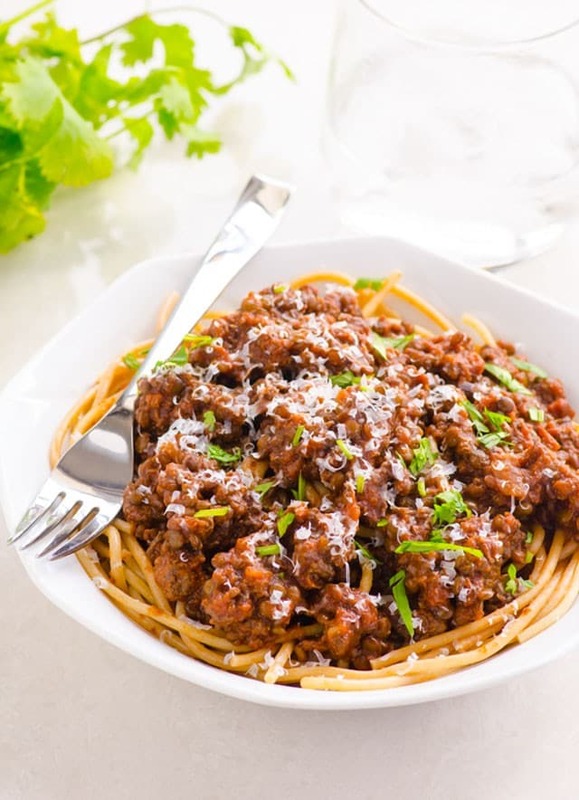 Ground meat of choice makes only 1/3 of the traditional Italian marinara sauce and the rest are lentils. Black lentils to be exact, which begin to be widely available. Lentils are high in fibre and rich in protein. Besides health benefits, substituting meat for lentils saves you quite a few dollars. I paid $2.50 for 2 cups of organic dry lentils at my local farm market. So, keep your eyes open next time you are grocery shopping. 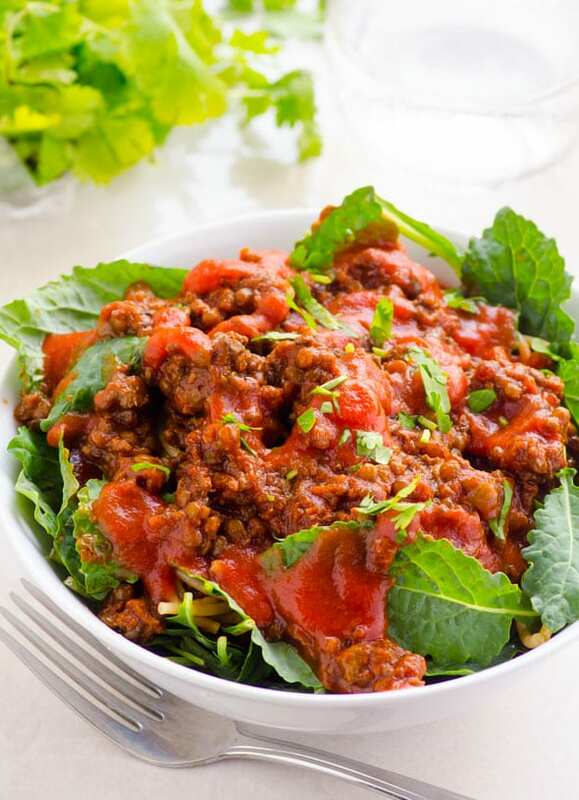 Also smaller in size than green lentils, black lentils make a perfect ground meat substitute creating similar lumpy texture. 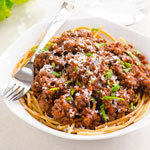 My kids loved this half meatless marinara sauce over whole wheat spaghetti. I enjoyed it over baby kale as there was plenty of complex carbs in the sauce itself. Moms understand – salad for dinner. :) This is also a large dish, so you can freeze the leftovers (instructions included). I also included nutritional info with WW Points for those who care. I hope your family enjoys this healthy dinner! Preheat large deep skillet or dutch oven on medium heat and swirl olive oil to coat. Add onion and cook for a few minutes, stirring occasionally. Increase heat to medium - high, add meat and cook for 10 more minutes, breaking into small pieces and stirring occasionally. Reduce heat to low - medium, add remaining ingredients and stir to combine. Bring to a boil, cover, reduce heat to low and cook for 50 - 60 minutes or until lentils are tender. Do not open! If sauce is too thick add some water but first stir and see. Serve hot over whole wheat pasta or any greens like arugula, spring mix, kale or Swiss chard. Storage Instructions: Refrigerate in an airtight container for up to 3 - 4 days. Freeze for up to 6 months. *I used strained tomatoes which are barely salted. Maybe start with 1 tsp salt and add to taste later. 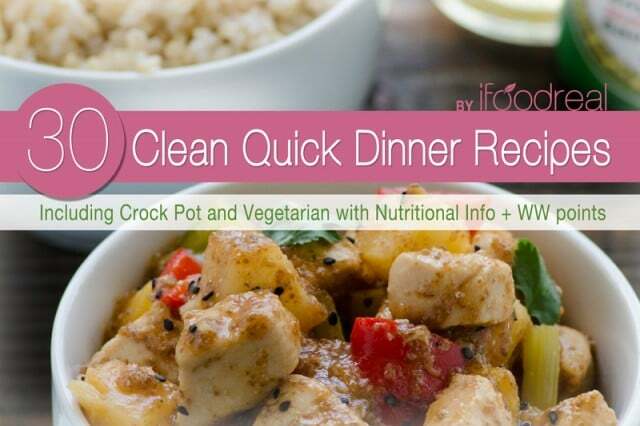 Enter today’s giveaway for a chance to win iFOODreal’s Clean Quick Dinner Recipes eBook through the Rafflecopter widget below – multiple chances for entries! It’s easy! Giveaway starts Wednesday, April 7, 2015. 3 Winners will be chosen and each will receive 1 copy of eBook. Winners will be chosen through Rafflecopter/Random.org. Winners will be contacted by me via email and will have 48 hours to reply before another winner will be selected. Good luck and thanks so much for entering! This looks divine! YUM! I think Josh could even get behind this! What am I making for dinner? Well…I’ve made AHEAD a pasta dish with chicken. Simple and easy for a teaching filled night! I want to try this recipe over spaghetti squash or zucchini noodles! For tonight I’ve planned petite crust-less quiches from the Skinnytaste blog. Ground beef tacos. I put a can of black beans in with the meat. It makes 1 lb of hamburger go farther for my three guys plus they are healty. I love this idea and will definitely try it soon. Oh, yum!!! Love the food. Love this recipe – I’m a huge fan of Olena’s dishes!! Love the idea of using lentils to bulk up the dish too. 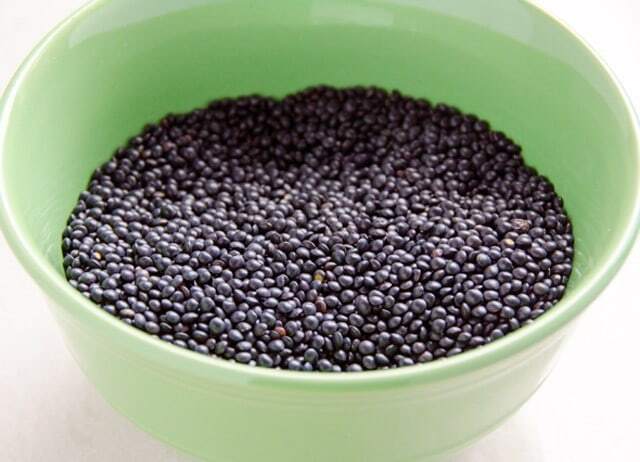 Black lentils are the best! I’ve never thought of adding black beans like that!! Love it. Headed over to check out Olena’s blog now to become a regular reader. Thanks for the intro!!! Oh my, I’m blushing right now from all the wonderful comments. Thanks so much for helping to spread the word about clean eating and health, Aggie! Thank you for allowing me to post! This sauce is genius! Great recipe!!! Love this recipe, we have also been trying to cut back on meat and eat healthier. 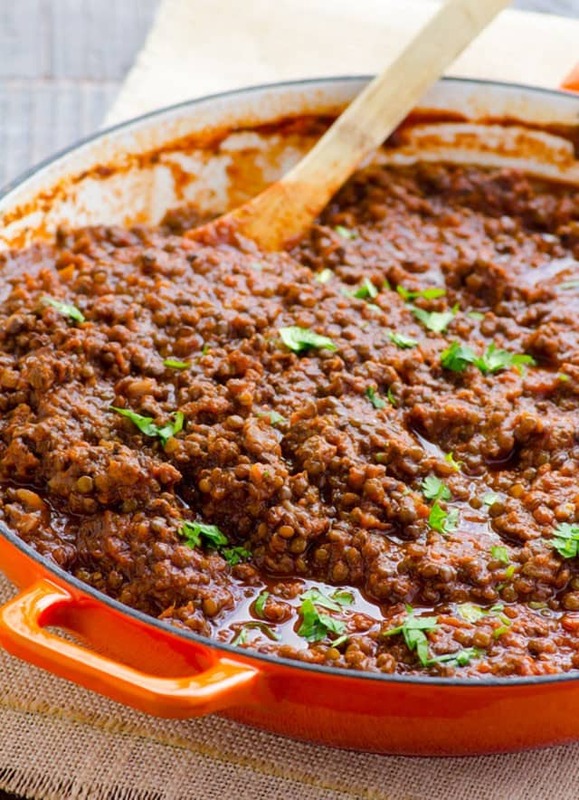 Love the idea of adding lentils to a sauce recipe. Looks delicious! On first glance I almost didn’t realize this sauce was meatless! Such a super delicious, comforting and surprisingly healthy marinara sauce.. I actually love lentils so this is a recipe I have to try. This is a fabulous recipe. I prepared it and it came out super tasty . My husband called and the second portion. I am going to make a lemon white bean spinach pasta per my husband’s request! This looks delicious! I am so glad I found your blog. I’ve made a few of your dishes and they were excellent! Thanks so much Andrea! I’m so happy you found my blog too! Salmon! Love this giveaway Aggie! Luv to have this recipe book..
Hi Aggie!! you always have the best recipes to share!! Lentils are my go-to for adding quick and easy protein without taking over the other flavors. Love everything about this recipe. This weekend I’m cooking up a few meatless favorites like a coconut chowder and braised vegetables. I’m always looking for better ways to make simple dishes seem more fresh and new. Thanks for posting this! We made pizzas and salad.